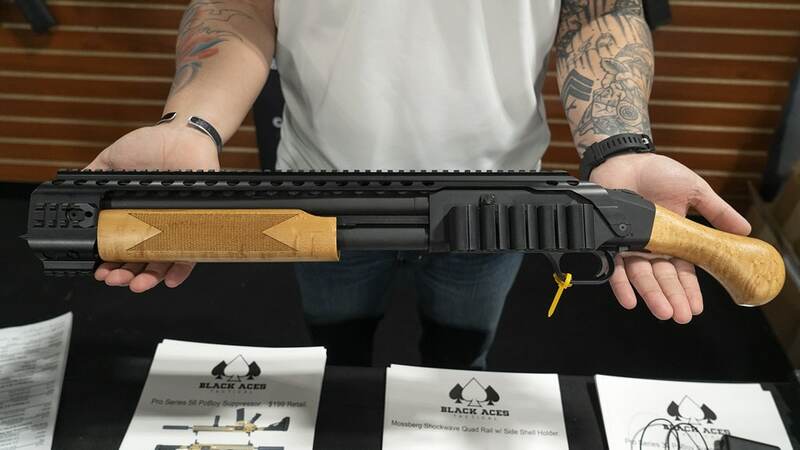 Black Aces Tactical was at SHOT Show 2019 showcasing their Mossberg Shockwave shotgun accessories. They manufacture a quad rail system and side shell holder out of T6 aluminum. It turns the Mossberg Shockwave shotgun into an attractive home defense weapon. The rail system allows you to attach a variety of accessories and the shell holder holds five rounds. The kit has an MSRP of $214. Black Aces Tactical also manufactures wood furniture for the Shockwave. It features deep checkering and is very easy to install. It comes in birds eye maple grade two as well as a darker walnut grade two wood. MSRP of the wood furniture is $199. Black Aces Tactical chose to accessorize the Shockwave shotgun because according John Quidgley of Black Aces Tactical, Mossberg made a very reliable and popular shotgun. It seemed only fitting to offer accessories to make it look as good as it shoots. Much more information is available on the Black Aces Tactical website.